"New Holland's Advanced Bird ID Guide" has taken the birding world by storm, being described by leading authorities as 'ground-breaking', 'innovative' and 'brilliant', and scooping the prestigious Birdwatch Magazine Bird Book of the Year Award 2010. This guide accurately describes every key detail of every plumage of all 1,350 species and subspecies that have ever occurred in Britain, Europe, North Africa and the Middle East - the region known as the Western Palearctic. Its level of detail is unprecedented for a book of its size. This book broke the mould for field guides as it contains no colour plates or illustrations, but instead its unique selling point is that for every species the detailed text lists the key characters of each recognizable plumage, including male, female, immature, juvenile, all subspecies and all other variations. This level of detail includes, for example, all eleven forms of 'Canada goose' and all eleven forms of 'yellow wagtail' known in the region. The detailed yet concise nature of the guide means that it has become an instant classic, with many birders, including the reviewer for BirdGuides, buying two copies: one for the field and one for reference to keep at home. 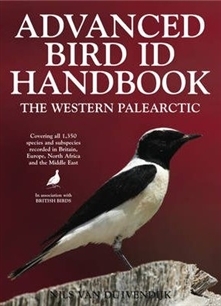 "The Advanced Bird ID Handbook" is intended as a reference companion for the original field guide. It has larger and more widely spaced text, and more than 100 additional pages, making it much more easy to use. In addition it has been fully updated with additions and amendments to the accounts of nearly every species, all recent taxonomic changes and new species in the region taken on board, and more than 20 tables giving side-by-side comparisons of the features of sets of similar species. There is also a full checklist of Western Palearctic species. Again the book will be endorsed by the renowned journal "British Birds", which has been running for more than 100 years and which has a dedicated and enthusiastic readership.